Another headrest is placed on a box below Queen Meresankh's armchair. Egyptians did not use pillows. Instead they used a wooden support to rest their heads on. Generally, headrests have a solid base and a carved head support which were connected by a short tapered column which was mortised and tenoned at both ends. Egyptian women shaved their heads to help with personal hygiene and wore wigs that were stored in reed boxes. Using a headrest might appear to us uncomfortable: some were padded inside but the majority were not. Possibly they were customised to fit an individual's head. Many examples of these headrests are displayed in museums. Most are of a simple construction such as those illustrated in the tomb of Queen Meresankh III. Some were produced with fluted columns and a few are elaborately decorated or covered in gilt like that of Queen Hetepheres. They also occur in stone, alabaster and in amuletic form. Egyptians would have slept on their side when using a headrest and in Kenya and other parts of Africa they are still used today. One of the most important mastabas at Saqqara, is that of Ti, which dates to the Fifth Dynasty. The walls of his tomb are carved with many reliefs showing scenes of activities performed as part of the normal daily life. One scene shows a number of carpenters manufacturing boxes and a bed under which is a headrest of the fluted column type. 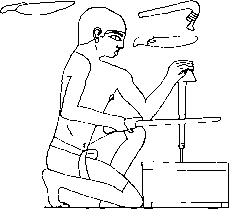 One pair of carpenters are hand-finishing the lid of a long box which is similar to the curtain box discovered in the tomb of Queen Hetepheres (figure 40). They are using sandstone blocks to smooth the grain of the timber, rubbing the block with the grain and not across it, which would have scuffed and damaged the timber surface. Another carpenter is using a bow-drill to make a handle hole in the lid of a simple rectangular box (figure 41). He kneels in front of the box he is working on, his right hand holding a bow. A length of cord is attached to both ends of the bow and is wrapped with a single turn around the wooden stock of the drill. His left hand applies pressure to the copper drill bit through a stone cup which fits over the top of the wooden drill stock. As the bow is pulled back and forth it rotates the drill stock and a hole is drilled by the copper bit.